Manchester United caretaker manager Ole Gunnar Solskjaer says he will “get the players enjoying football” again following the sacking of Jose Mourinho. United appointed their former striker as boss until the end of the season on Wednesday, a day after Mourinho was dismissed. Solskjaer, 45, takes over with United sixth in the Premier League. The Norwegian told MUTV that he wanted to see the players “express themselves” during the rest of the campaign. “We will get the players enjoying football and looking forward to seeing the supporters again,” he said. Mourinho was sacked after no progress with results or style despite spending nearly £400m on 11 players in two and a half seasons in charge, while many of United’s performances this season have lacked fluency. What can Man Utd expect from Solskjaer? Title winners to ‘rotten to the core’ – where did it all go wrong for Man Utd? Why Man Utd need a director of football – and is Mitchell the ideal candidate? 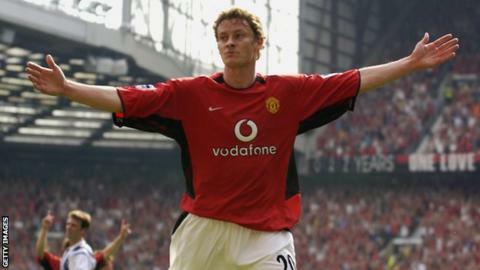 Solskjaer spent 11 seasons at Old Trafford, scoring the winning goal in the 1999 Champions League final, and said his return “feels like coming home”. He also promised fans that he would “give everything” to “bring the club success” and get players “enjoying football”. “We have to get used to winning again and challenging for trophies,” he added. Solskjaer’s first match in charge will be at Cardiff – where he had an eight-month spell as manager in 2014 – on Saturday at 17:30 GMT. He was relegated from the Premier League with the Bluebirds in 2014, then sacked after a poor start to the Championship campaign. In his first spell as manager of Molde from 2011 to 2014, he won the Norwegian league twice and Norwegian Cup once. He returned to the club in 2015 and signed a new deal there earlier this month. “The more mistakes you make, the more you learn and I’ve made a few mistakes,” he said. Solskjaer said he felt he needed to bring in the “experience” of Mike Phelan, who returns as first-team coach having previously worked as United assistant manager alongside Sir Alex Ferguson. “He’s done it all, is an incredible calming influence on me and his football knowledge is really good,” added Solskjaer.